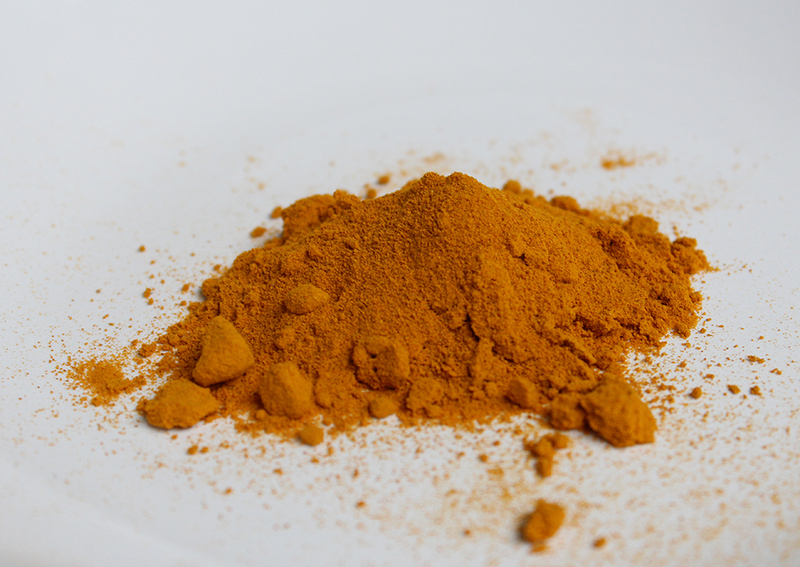 I recently read a blog post by Mari at Gather and Grow, she had dyed with turmeric using solar dyeing and without any mordants. I had a look around in my spice rack and found a jar of turmeric powder that had expired four years ago. I decided to have a go with that. I used mordanted wool because that’s what I happened to have (alum and cream of tartar) and I also used heat. I heated the water and mixed the turmeric powder into it. When I added the wet yarn the dye immediately dyed the yarn and I only let the yarn be at the dye for 15 minutes. 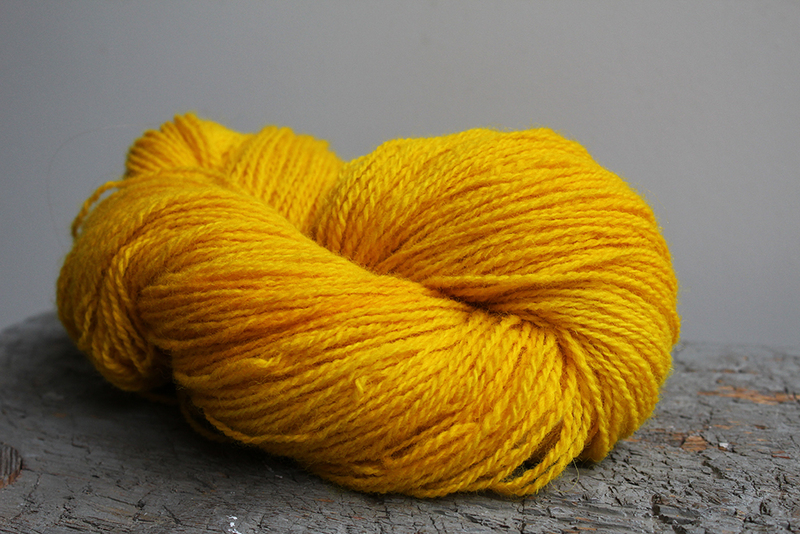 I used the the dye again and dyed another 100 g skein of wool and it came out exactly the same colour. Turmeric is strong stuff! 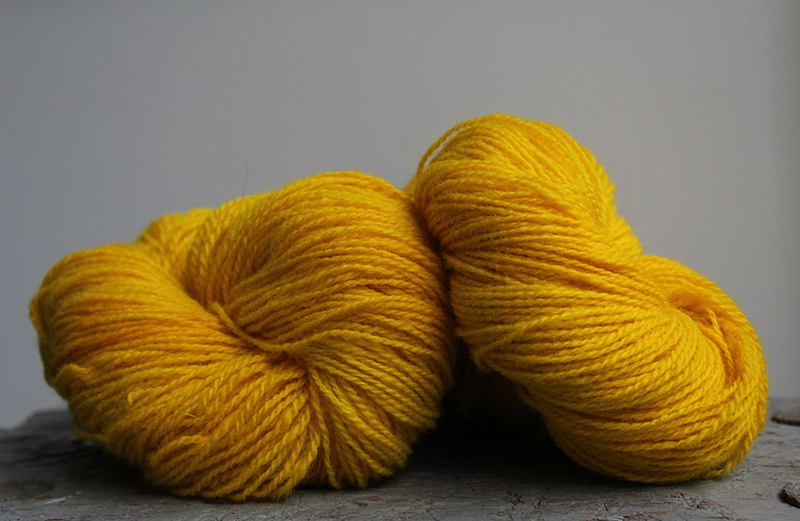 I feel like a much less turmeric would have been enough and that I could still dye a lot of yarn with the dye. I have it saved it case I want more. The only downside is that the smell stays quite strong in the yarn, even though I rinsed it a lot. It is nice to use things laying around the house for dyeing. I have discovered that the color lasts better if you dye first with pomegranate and then over dye with turmeric ( I tested it with 10 hot water machine washes while fulling a piece). I can’t remember where I read the info but it works. You could try a vinegar water rinse to reduce the smell. I have been using the powder, but I believe you can also dye with the skins. It gives a duller yellow, a bit lighter than yellow ochre, however if it is used on grey yarn or white yarn post dipped with iron you get a lovely olive green. The pomegranate and turmeric mix gives an amazing yellow orange color. 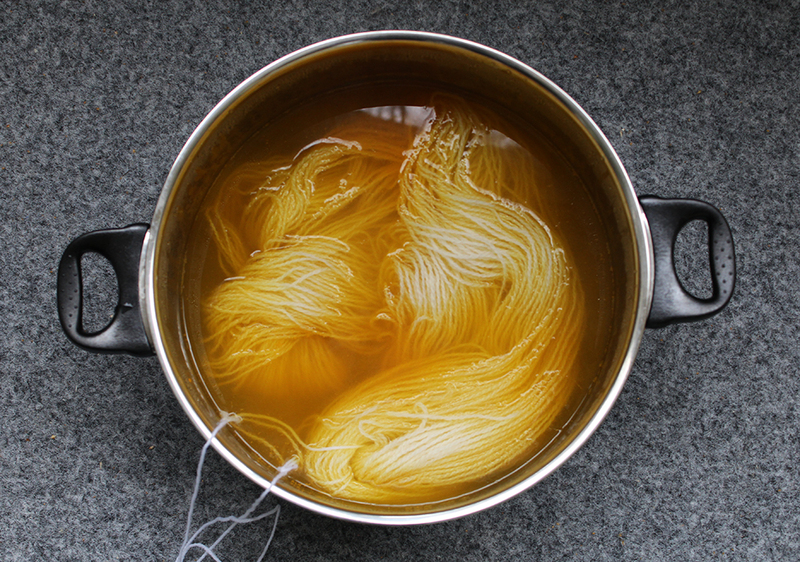 When I used turmeric on its own I found over the course of time it did fade a bit, but then I think we have to think in terms of natural dyeing being fluid and organic, that is some of the charm. Very interesting indeed! I will have t give this a try sometime.